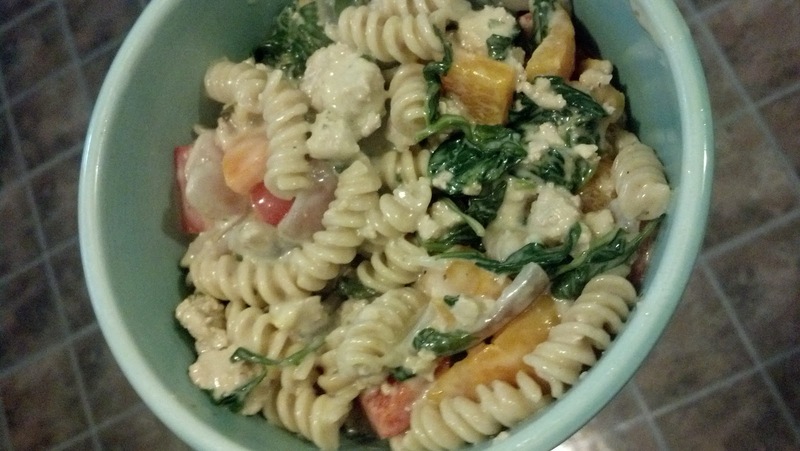 I had some ground chicken to cook up and here's how I used it! * Brown ground chicken at medium heat with some olive oil. Start water for boiling pasta. * Toss in your chopped veggies and let them cook up, then add the spinach towards the end. 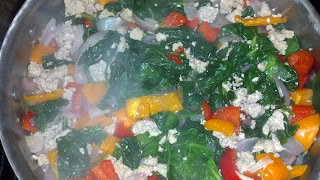 Put a cover on and let simmer for 2-3 minutes until spinach is wilted. Add herbs. The whole package will cook down nicely. Cook pasta to desired tenderness. * Once spinach is cooked down, drain excess fluids and then return to heat. Add in jar of sauce or homemade sauce and let it warm up. * Mix together the veggie/meat mixture and pasta in a nice big bowl and enjoy! Makes about six yummy servings.